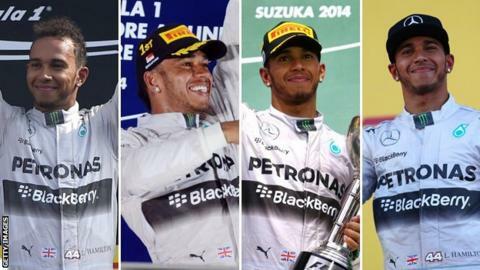 Any driver who has won four races consecutively has gone on to win the World Championship that year. And Lewis Hamilton has now done that twice this season. They say there are "lies, damned lies and statistics" but nevertheless there is more than momentum behind Hamilton's charge for the championship. Hamilton's Mercedes team-mate Nico Rosberg continues to show great speed and professionalism, but one big question hangs over him. He has yet to win a wheel-to-wheel battle with Hamilton. It's not a question of deserving the championship or otherwise. Rosberg has won multiple races and had lots of pole positions, and lesser achievements than that have won world titles - namely for his father Keke, who won a single race in his championship year in 1982 and did it on the basis of consistency. There seems to be such confidence within Hamilton about what he is doing that he did not even really defend when Rosberg came down the inside of him heading into the first corner in Russia at the weekend. That is very unusual - a lot of drivers make very aggressive moves at the start to defend their position. I found that fascinating. It was almost as if he was saying casually: "Oh, OK, he's passed me. I'll get him back. I've got 53 laps to do this." Or perhaps he had such confidence in his ability on the brakes - where he had an advantage over Rosberg into that corner all weekend - that he was thinking: "Well, let's see how this works out when we get into the braking zone." It was a very solid weekend from Hamilton, who appeared to have an advantage throughout. Rosberg's error on the brakes at the start, locking up and going straight on, was the latest in a string of mistakes in recent races. Hamilton has not been infallible this season, but his mistakes came earlier in the year, when there was a lot more opportunity to win back any deficit. Rosberg has not made any more mistakes than Hamilton, but his errors have tended to come when he is in front. Let's give it a bit longer before drawing conclusions, but if Rosberg makes another error in that sort of situation then it might start to look as if there is some foundation to the views of those suggesting the pressure is starting to show. The battle is fascinating to watch, and Hamilton is maintaining this apparent Buddha-like calmness compared with the Lewis of old. The title battle was only ever really a two-horse race between Hamilton and Rosberg. Red Bull's Daniel Ricciardo was hanging on gamely but he has now finally dropped out of contention, with a 92-point deficit to Hamilton and only 100 still available. Mercedes' clinching of the constructors' championship with effectively four races still to go - if we allow for the double points at the final race - underlines that in this new turbo hybrid fuel-restricted Formula 1, they are in a class of one. This is dominance of a level we have not seen for quite some time. The fact that Red Bull have got themselves into second in the constructors' championship says a lot for the performance of their car and the strength in depth of that team, but Mercedes as an engine supplier has done an exceptional job and it is only fair that is recognised. I am old enough to have lived through Imola '94 and Ayrton Senna's death, when Formula 1 faced an even worse scenario than the aftermath of Jules Bianchi's accident at the Japanese Grand Prix. As I write this, Bianchi remains in a critical condition in hospital in Japan and, as you would expect, there has been a coming together in support of his Marussia team and to help Jules and his family through this difficult time. Governing body the FIA made the right choice in holding a news conference at the Russian Grand Prix and making as much of the information surrounding the accident available as possible. I don't think anyone can be faulted in the aftermath of the accident but inevitably there has been a mixture of emotions, from shock, through sadness and in some cases anger. Four-time world champion Alain Prost has been quite outspoken, expressing his fury that a recovery vehicle was on the circuit in a position where it could be hit. That is understandable, but we also have to recognise that this is something that has continued to be practised in the recovery of stranded cars for the past 20 years - since Martin Brundle nearly hit a tractor at the same corner in Suzuka and ended up badly injuring a marshal. Last year, a marshal was killed after being run over by a recovery vehicle in Canada. Given all that, it is inevitable that there will be a change to remove this risk, either by neutralising the specific accident zone by slowing all cars down to the same speed, or by using more safety cars. You can play the hindsight game if you like and ask why something had not been done before. But we have to recognise that every single person in F1, whether it be mechanic, marshal or racing driver, knowingly accepts the challenge, excitement and risk of the business we are part of. I don't know all the details of the situation that has led to Fernando Alonso apparently leaving Ferrari and Sebastian Vettel apparently joining - it all still needs to be officially confirmed - but if I believe the intelligence that has been gathered then it does look as if Fernando has been out-manoeuvred. He has been released from one contract without having another in place, and that does have implications for his negotiations, however badly McLaren want him. What will happen to Alonso? Will he take a year out? Race a year in sportscars? Drive for McLaren? All while he has his eyes firmly fixed on a Mercedes seat in 2016, which doesn't look like it's available. In Hamilton's BBC interview after the race, he talked about going through cycles in life. He had a several-year cycle at McLaren and now he wants to go through the same sort of cycle at Mercedes. There is nothing right now to suggest that is not completely sincere. And once the championship is settled, I would expect in fairly short order afterwards an announcement about his future at Mercedes. So with Rosberg already signed until at least the end of 2016, there does not seem to be a fit for Alonso anywhere other than McLaren-Honda. I've seen Alonso's comments about there being an announcement soon and that when it happens it will be "obvious" that his mind has been set for some time. But from controlling the market, he appears now to be left with a choice between McLaren and a year out, and it seems that while there is a calm Spanish swan above the water, below the surface there is a lot of flurry and activity to sort his future out. Alonso is into Far Eastern philosophy, particularly the samurai warrior Miyamoto Musashi's Book of Five Rings. But clearly the chapter about how not to be left standing when the music stops wasn't in that book. That's the only problem when you refer to a book written 500 years ago. Five centuries on, it doesn't always apply. Read more on Fernando Alonso: Join McLaren now or gamble on Mercedes?